Eric/maquette, 1990, color Polaroid with ink, paint and tape mounted to foamcore, image; 24 x 20 inches mounted; 32 3/8 x 23 inches, signed, titled, and dated recto in ink, unique. The photographs are overlaid with a grid and translated, cell by cell, into the final painted portrait by hand. This painstaking process emphasizes the distinctly analogue nature of the finished product and focuses attention on the complex relationship between photography and painting, between the mechanical and the hand-made. 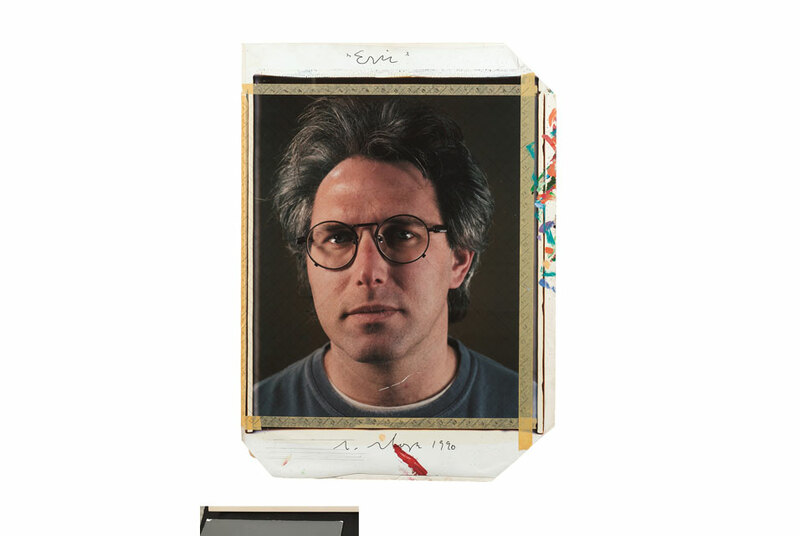 Chuck Close Photo Maquettes includes images of many close friends and fellow artists, including the composer Philip Glass, artist Elizabeth Murray, and the art collector and philanthropist Agnes Gund. Self-portraiture has always been an important area of exploration in Closes work, and this exhibition brings together eleven self-portraits from as early as 1975 to more recent examples from 2011. A fully illustrated catalogue accompanies the exhibition, with a new essay by art historian and artist Jonathan Weinberg. Eykyn Maclean is a private art gallery with locations in New York and London, specializing in museum caliber work by key Impressionist and 20th century European and American artists. Christopher Eykyn and Nicholas Maclean established Eykyn Maclean in New York in 2006, launching their exhibition program in 2010 with the critically acclaimed show In Giacomettis Studio  An Intimate Portrait, which was followed by Matisse and the Model (2011). Eykyn Maclean opened their London gallery in Mayfair in February 2012 with Cy Twombly: Works from the Sonnabend Collection. Other exhibitions include Interviews with Artists (London, 2012) and Andy Warhol Flowers (New York, 2012). Chrysler Museum roadshow takes the art into the air with Rafael Lozano-Hemmer's "Airborne"